Victory Housing/Brinshore Development Selected to Redevelop Hebrew Home Property | Park View, D.C.
A copy of the full press release is available here and after the jump. (WASHINGTON, DC) – Today, Mayor Bowser and the Office of the Deputy Mayor for Planning and Economic Development (DMPED) announced Victory Housing with Brinshore Development as the developer selected to redevelop the historic Hebrew Home at 1125 Spring Road, NW in Ward 4. The project will produce 187 residential units, with 80 percent of the units created as affordable housing for seniors and families. 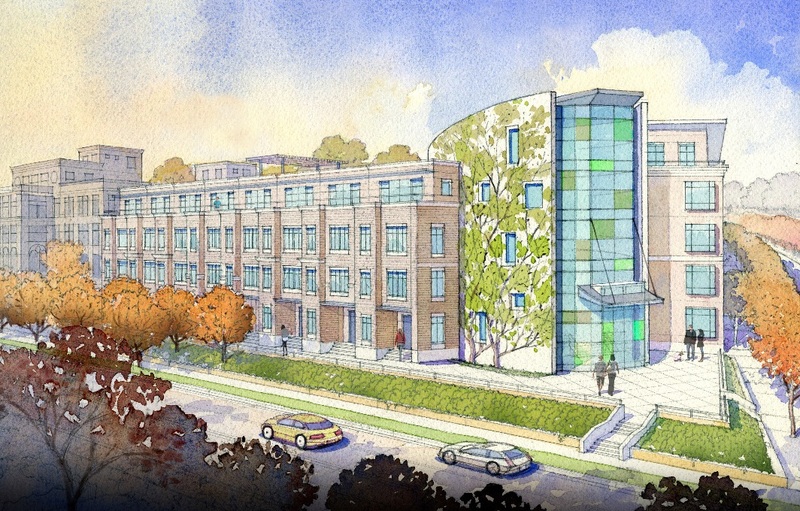 The 1125 Spring Road, NW site was the third project under Mayor Bowser’s OurRFP process, which incorporates community feedback early in the Request for Proposals (RFP) process and ensures that the priorities and perspectives of residents are considered during development. After extensive community engagement as part of the OurRFP process, both ANC 4C and ANC 1A passed resolutions recommending the proposal by Victory Housing as their preferred choice. The development team of Victory Housing, Brinshore Development, and Banc of America Community Development Corporation was selected for the redevelopment of the 144,400 square-foot property that includes the Hebrew Home for the Aged, a vacant former community health center, as well as the adjacent former Paul Robeson School. Victory Housing’s project, which is designed to achieve LEED Gold certification, will include the creation of 187 residential units through a mix of townhomes and apartments. The project will include the creation of 88 units of affordable housing for seniors at or below 60 percent Area Median Income (AMI) through the adaptive preservation of the historic Hebrew Home building as well as the creation of 62 units of affordable housing in a newly constructed building at the current site of the Paul Robeson School. The project at 1125 Spring Road, NW was the third iteration of the OurRFP initiative. The District’s other OurRFP projects include: The Crummell School (1900 Gallaudet Street, NE); Parcel 42 (1707 7th Street, NW, and 639 Rhode Island Avenue, NW); Northwest One (1010-1024 North Capitol Street, NW, and 33 K Street, NW); and Eastern Branch Boys and Girls Club (261 17th Street, SE). To read more about OurRFP projects, visit dmped.dc.gov/page/our-rfp. Since coming into office, Mayor Bowser has produced or preserved nearly 4,000 units of affordable housing, with more than 5,000 units in the process of being constructed. More information about affordable housing projects around the city can be found at open.dc.gov/economic-intelligence. This entry was posted on August 23, 2017 at 7:01 am and is filed under Development, Historic Landmarks, Housing, Seniors. You can subscribe via RSS 2.0 feed to this post's comments. Glad to see this moving forward in this way! Thanks to you and the ANCs for continuing to push for affordable housing in Parkview and nearby neighborhoods. Hi Kent, Do you have a contact person at Brinshore Development? I would like to contact them to see about supplying some of the materials that they might need.